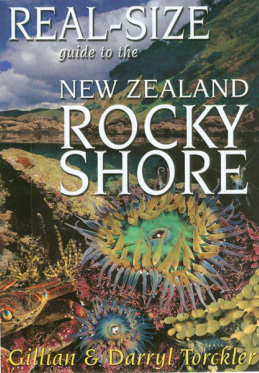 This is a partner to the popular Life-Size Guide to New Zealand Fish. A Photographic guide. Different habitats splash zone, upper shore, intertidal zone, rock pools, lower shore and underwater are presented in full colour montage free of any text. This is followed by a monotone picture overlaid with identification and information boxes for each animal. This is a species guidebook like none other. Your family will return to it over again. It is possible to dip in and out of the book as needed, without the need to read the entire text in one sitting. But if you do that, you will no doubt read some interesting fact or tow that you had forgotten or not know previously. There is a handy species index explaining all of the linkages between these creatures. Just like many other New Zealanders, we spend a lot of time on or around the beach and rocky shore. Along the way, lots of interesting shapes and colours catch our eye—myriad life that gathers in this most harsh environment. We have often returned home to scour our library books trying to identify our latest find. We are often met with frustration by poor quality black and white photography or line drawings that leave us none the wiser. In this series of books, we have tried to show people what these creatures look like in real-life: in true living colour and actual size.